This book will give you greater negotiation options and strategies — to help you unlock a GREAT deal. If you’re lucky in life you can learn from people more experienced that you. This book draws together strategies for success in negotiating real estate and other deals as an investor, seller, buyer, landlord or tenant. 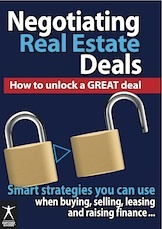 Negotiating Real Estate Deals – How to unlock a GREAT deal is an approachable, digestible guide to what works (and doesn’t) in this vital area. Available as an eBook. Get the inside story on how you can greatly increase your ability to achieve the results you want in a negotiation. Learn about the costly mistakes some investors make when faced with a negotiation – and how you can avoid them. Discover the three crucial variables of ANY real estate negotiation – and how you can use them ethically, responsibly, to your advantage. Find out how to make the best of almost any negotiation by using proven, time-tested, specific and relevant techniques that apply directly to local conditions. Negotiating Real Estate Deals – How to unlock a GREAT deal will give you practical and useful tools, tactics and procedures, and – more importantly – it will help you develop your own successful approaches to different real estate negotiation situations. You won’t win every time, but you’ll do much, much better if you apply what you learn from this book. You’ll discover how to build your negotiation skills and awareness. You’ll gain knowledge that you will be able to use over and over again, in deal after deal, year after year. Should you lay your cards on the table or keep them close to your chest? Sometimes it pays to be candid. Whose paperwork or lease form? What are the implications of using theirs? Order your eBook here (includes printable PDF & ePub versions). Find a way to benefit from the experience of others you can trust. Get them (or their information) into your circle of influence. If we can help, great. That’s what we aim to do. This entry was posted in Articles and tagged Negotiation. Bookmark the permalink.